Natanya is a researcher in the fields of youth and female entrepreneurship in the School of Management Sciences while Johann is the manager of the NWU’s bhive Enterprise Development Centre (EDC). Both these experts reside within the Faculty of Economic and Management Sciences. The annual lekgotla represents a dynamic collaboration between the Department of Higher Education and Training (DHET) and Universities South Africa (USAF), and aims to create a platform from where best practices could be shared in terms of the advancement of entrepreneurship development within the realm of higher education. In addition, delegates have the opportunity to engage with other experts and foster collaborative relationships across disciplines and institutions for the benefit of South African students and the economy. This year saw a three-day interactive event with several workshops being presented by national and international experts. With a strong focus on the interests of academics, support professionals and practitioners in the university entrepreneurship development space, the lekgotla was primarily dedicated to the primary goals of the EDHE, i.e. the developing of student entrepreneurship, entrepreneurship development in academia and, the development of entrepreneurial universities. According to Natanya, who took to the podium to deliver an address titled “A practical approach to supporting student entrepreneurs in partnership with the local business community”, she took part in discussions relating to student entrepreneurs currently within the realm of higher education. As a member of the DHE’s Student Community of Practice (COP), Natanya is a fierce advocate of entrepreneurship as a tool for economic development and regeneration. In response to the high levels of unemployment in South Africa, the DHET introduces new measures to stimulate entrepreneurship development at universities. Higher education institutions are well place to catalyse entrepreneurship and innovation for the development of a new economy. In this light, a vibrant entrepreneurship ecosystem at universities would, amongst others, encourage students and graduates to consider entrepreneurship as a career path. 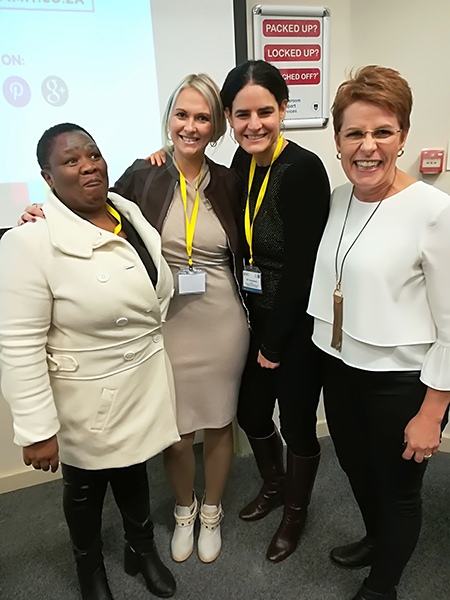 Dr Thobeka Ncanywa (University of Limpopo), Natanya Meyer (NWU), Elli Yiannakaris (Chairman: Raymond Ackerman Academy for Entrepreneurship) and Margaretha van Schalkwyk (Operational Director: Innovation Summit).